Tokyo - Honorary Chairman of Toyota Motor Corporation (TMC) Shoichiro Toyoda today officially received the Bintang Jasa Utama medal from the Government of Indonesia presented by the Indonesian Ambassador to Japan, Yusron Ihza Mahendra, held at the Indonesian Embassy in Tokyo - Japan, today (Wednesday , 15/12). 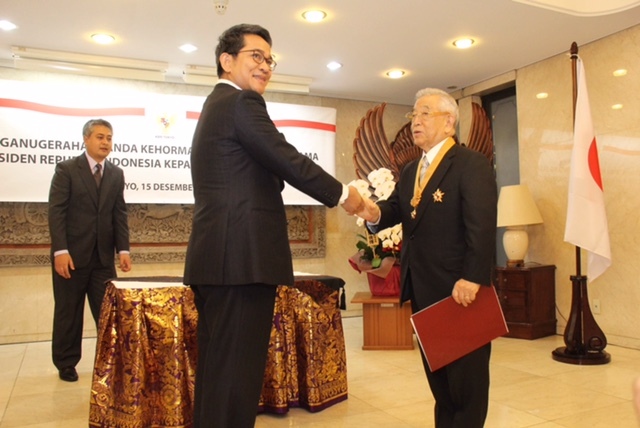 Shoichiro Toyoda is one of 13 recipients of Bintang Jasa Utama as the Decree of the President of the Republic of Indonesia Joko Widodo, dated August 7, 2015. "I am very grateful for the gift of Bintang Jasa Utama from the government of the Republic of Indonesia. We at Toyota are committed on keep continue to contribute the economic and social development in Indonesia through the Indonesian automotive industry, "said Shoichiro Toyoda. Bintang Jasa Utama is one of the three civilian medals star issued by the government of the Republic of Indonesia, with a degree level under Mahaputra star (Bintang Mahaputra). The star issued and given to those who contributed in Indonesia in a certain field or a particular event or thing outside the military category. Shoichiro Toyoda was born on February 27, 1925 and joined TMC in July 1945. Throughout his career, Shoichiro Toyoda, known as Dr. Toyoda has a focus on automotive technology, quality control and factory management. In 1982, Dr. Toyoda served as President of TMC for 10 years and then became Chairman of the Board from the year 1992 to 1999 before occupying the position of Honorary Chairman until now. Toyota in Indonesia has had a long history of more than 40 years. Started as a company importing Toyota cars branded with the name of PT. Toyota-Astra Motor, Toyota in Indonesia now consists of two companies, namely PT. Toyota Motor Manufacturing Indonesia (TMMIN) that producing and exporting branded Toyota automotive products such as whole vehicles, disassembled vehicle, gasoline engines, components, and production support tools; and PT. Toyota-Astra Motor (TAM), which distributes branded Toyota cars in Indonesia. TMMIN and TAM employs more than 10,000 employees until November 2015. In accordance with the philosophy to always develop team members before developing a product through the slogan "We Make People Before We Make Product", Toyota Indonesia continuously conducting sustainable development of human resources. Human resource development is a key role for Toyota Indonesia to implement Monozukuri. It needs human resources who had a determination to increase knowledge and challenges that Monozukuri form for continuously making higher-value products and worth more can be achieved. Various activities on developing Human Resources were held to further enhance the skills, knowledge and abilities of employees of Toyota Indonesia. Human resource development activities is also transmitted to the business chain of Toyota Indonesia as local suppliers and dealers in order to create a domino effect. This effect is expected to contribute to the creation of human resources that are reliable and competitive in the Indonesian automotive industry that can bring Indonesia's automotive industry to becoming increasingly large. Meanwhile, the efforts to increase the localization being conducted by Toyota Indonesia. In 2013, TMMIN open Karawang Plant 2, which then produces local Etios models, Yaris, Vios, and Limo besides Kijang Innova and Fortuner that have been produced in Karawang Plant 1. With this local production, in 2014, 96% of the sales of the Toyota brand in Indonesia is the work of TMMIN employees in Indonesia. Meanwhile, the level of local content in products TMMIN has also increased. Recently, the 6th generation Kijang Innova has a 85% local content, an increase from the 19% level in the first generation Kijang, which was launched in 1977. A total of 123 local suppliers are members of the production activities in TMMIN and each has suppliers are at level 2 and 3. Toyota Indonesia also keep continuing its efforts to increase export activity of vehicles, engines, components, parts, and production support tools. Starting with the whole vehicle exports the 3rd generation of Kijang in 1987 with a volume of 500 units per year, in 2014 Toyota Indonesia recorded a complete vehicle export volume amounted to 160,000 Toyota branded units or more than 80% of total exports of complete vehicles from Indonesia. Exports of Toyota Indonesia addressed to more than 70 countries in the Asia-Pacific, Africa, Latin America, the Caribbean, and the Middle East. Toyota Indonesia is committed on growing together with and contributes to Indonesia through the global quality of manufactured products, and takes part in the development of the national automotive industry.